because the jewel-belled girdle is made up of twisted golden strings. When ambaaL gracefully walks over, not only the ornaments round her ankles but the jewels of the girdle also jingle ! The whole earth is personified as BhUmA-devI. When one visualises that form, the geographical location of the navel for that form on the earth is said to be Kanchipuram. 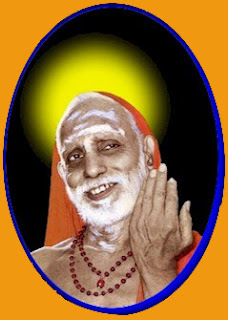 When the girdle with bells is also imagined at its location on the waist, the facade of that girdle comes at the position of that navel; and that is why the kshetra (place) also gets the name of Kanchi !